Chef Daniel Humm, of 11 Madison, is one of the finest chefs in America so when the Austrian government extended an invitation to a press lunch at his restaurant, featuring "the Best of the ALps," I accepted without hesitation.The three course lunch was utterly exquisite. 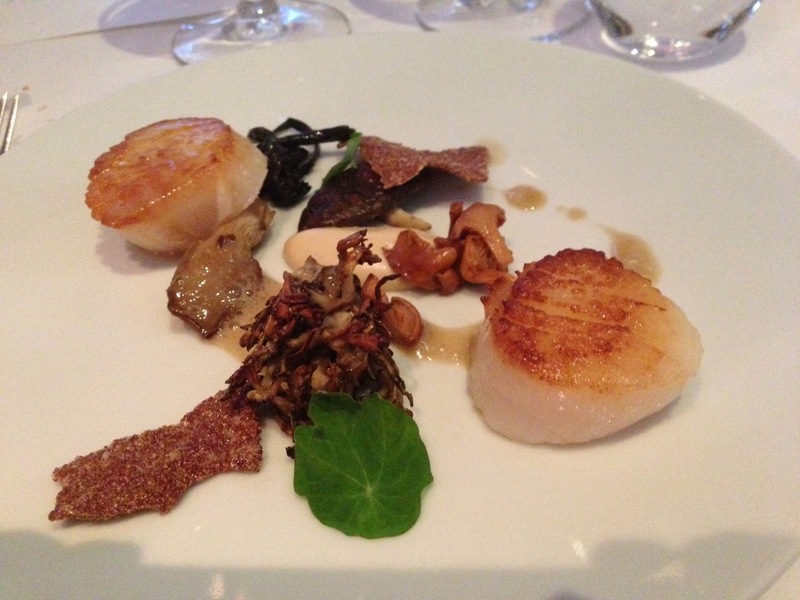 The first course, scallops seared with chanterelle and other wild mushrooms, pine nuts and bulgur wafers, were silken and perfectly carmelized. 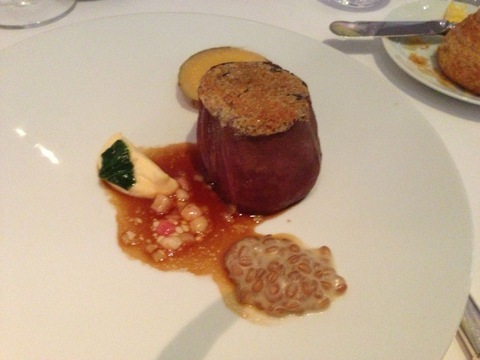 The beef, roasted with bone marrow, rutabaga, and rye berry was perfectly cooked, rare throughout. The bone marrow gave the sauce a fabulous flavor and texture. 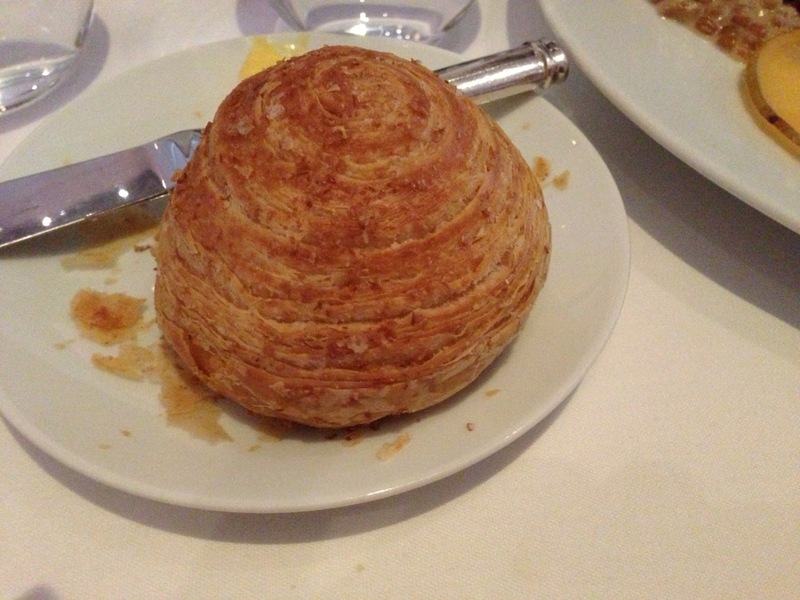 The rolls were an amazing cross between a soft white dinner roll with the flakiness and crisp crust of a croissant. And the caramel ice cream with chocolate ganache was so delicious I asked for a second serving. The slide presentation of the stunning resorts nestled in the alps, from Germany, Austria, Switzerland, and France reminded me of long ago ski trips when I felt like I was skiing on top of the world. During the lunch the representatives from each country moved from table to table to meet and greet. And toward the end, the representative from Zermott, came to our table to offer us little pins of the matterhorn. When he presented me with one he fumbled and dropped it on my napkin where it promptly disappeared into one of the folds. Groping under the napkin in a desperate attempt to locate the pin, he went into his preplanned speech saying "I want to offer you a very personal invitation." How could I resist? My response: "It doesn't get more personal than this!" All I can say is that there is only one thing more enjoyable than excellent food and wine and that is laughter. I had my fair share of all three at this lunch.